Rodney Hood and Alec Burks are back in town as Jazz host the Cavs. No hard feelings? It was already an emotional experience for members of the Jazz when they faced former teammates Alec Burks and Rodney Hood two weeks ago in Cleveland for the first time since each had been traded to the Cavaliers in separate deals. Facing them Friday night at Vivint Smart Home Arena will present an altogether different dynamic — especially for the two returning players. Burks, who was dealt in late November in exchange for 3-point specialist Kyle Korver, acknowledged dealing with a wave of conflicting feelings. Hood, meanwhile, who was sent away last Feb. 8 as part of a three-team deadline deal that brought Jae Crowder to Utah, said that enough time had passed now that he was at peace with it. That said, both players conceded that being traded from the Jazz took them by surprise. Burks said he was taken aback when, shortly before the Jazz were to play the Nets in Brooklyn, coach Quin Snyder and general manager Dennis Lindsy broke the news to him. Alec Burks on the trade: "At the time I was shocked. I had never been traded before, I didn’t know it was going to happen." Hood, meanwhile, recalled being not so much shocked as crestfallen with the way things worked in Utah. With Gordon Hayward having departed for Boston the previous summer, the Jazz had begun the 2017-18 season with some thought that Hood might take over as the featured scorer. But it didn’t work out that way. Still, he said that the time since has given him perspective and a nuanced outlook. Both players said they’re still close with many in the organization; each specifically mentioned staying in contact with Donovan Mitchell, Joe Ingles, Royce O’Neale, and Ekpe Udoh. Hood also said he maintained contact with Rudy Gobert, plus assistant coaches Johnnie Bryant and Tony Lang. Burks said he also still talks to Crowder, and that Dante Exum reached out to him before the teams’ Jan. 4 matchup. Several with the Jazz made it known that the feelings of continued respect were mutual. Snyder, meanwhile, noted that while the team has obviously made it work with Crowder and Korver, that doesn’t mean he doesn’t have mixed feelings about dealing away Burks and Hood. They probably have a warm reception at Vivint Arena ahead of them, too. Both said they were very much looking forward to returning to Salt Lake City for the first time — to visit old haunts, to reconnect with people in the organization, and to interact again with a crowd known for its intense loyalty to its players. AB still talks to Jazz: "I talk to Donovan, Jae, Royce, Ekpe, I talk to him a lot. I talked to Dante yesterday, I talked to Joe Ingles a little bit. I talk to everybody." Burks, meanwhile, never known for being particularly loquacious, spoke perhaps most passionately about his certainty that Jazz fans would come correct. Tipoff • Friday, 7 p.m.
About the Jazz • After Wednesday’s win vs. the Clippers, Utah is on a season-high five-game winning streak. … Donovan Mitchell is the first Jazz player since Karl Malone in 1999-2000 to score 25 or more points in seven consecutive games. … Rudy Gobert is the first Jazz player since Malone in 1988 to have back-to-back games of 20-plus rebounds. 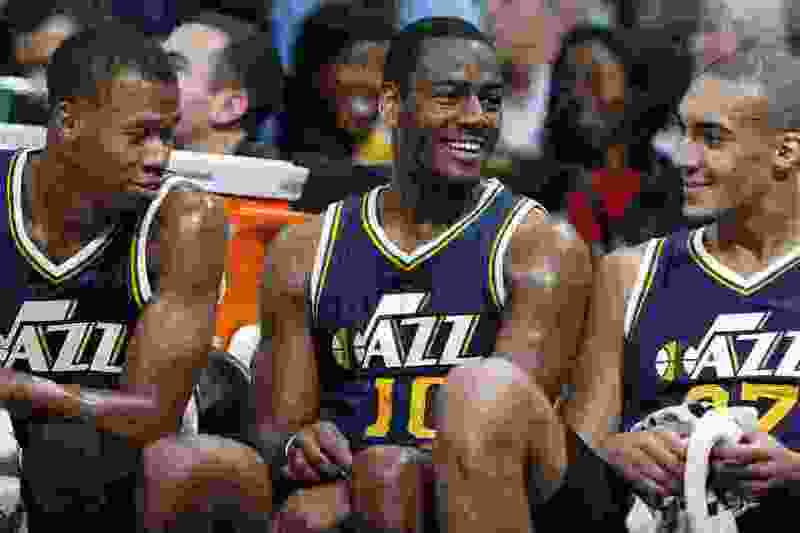 About the Cavaliers • Former Jazzmen Alec Burks and Rodney Hood will be playing in Utah for the first time since being traded to Cleveland. … Hood is averaging 13.0 ppg this season and shooting 37.1 percent on 3-pointers. Burks was averaging 8.4 ppg in 15.8 mpg with the Jazz this season, but has bumped those numbers to 11.9 ppg in 28.9 mpg with the Cavs. … All-Star forward Kevin Love has played just four games this season due to left toe surgery.